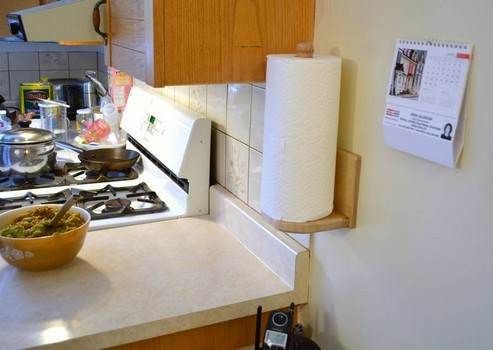 Paper towel racks are an indispensible part of any kitchen. 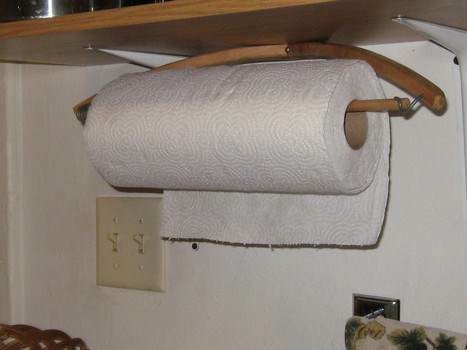 Build one or several, using free paper towel rack plans. Stand them up, lay them down or mount on the wall. The choice is yours. With so many sizes and styles, one is sure to be a hit in your home. Paper towel rack plans are a fast and easy project for a beginning DIY crafter, or an inexpensive gift that the kids can help with for holidays, showers and birthdays. Pick a plan and then use your imagination. Select woods and stain to match kitchen decor, or use inexpensive pine and paint for a fun and cheery accessory. Paint, stencils, decoupage and other decorative finishes will add a touch of whimsy and style to an often-overlooked kitchen tool. 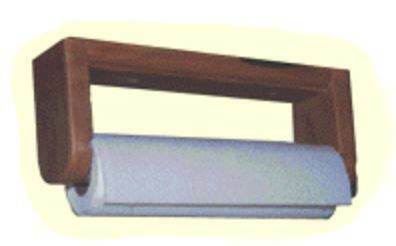 Why stop with one; make one for office, hobby room, workroom and your best friend. 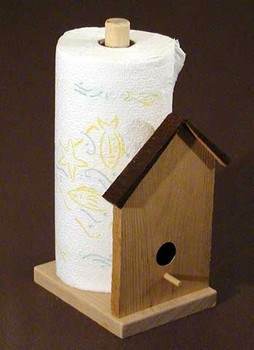 Build a paper towel holder that has the look of a bird house on the front using this simple woodworking plan. Here are detailed instructions on how to make this simple paper towel holder using a 1 1/4 inch dowel and few other materials. 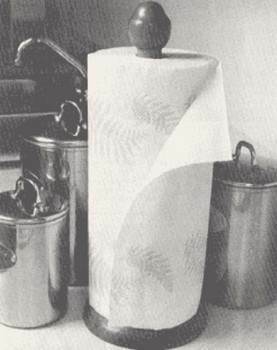 A piece of cooper tubing with cap is placed into a wooden base to make this attractive paper-towel holder. Plumping hardware and a piece of scrap wood for the base make an industrial style paper towel holder. 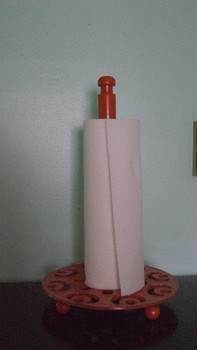 Here is an easy to follow plan for making an all wooden paper towel holder designed to keep towels from unraveling. 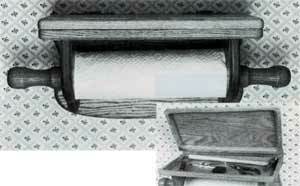 Secure a wooden hanger to the bottom of a cabinet and you have a paper towel holder in just minutes. 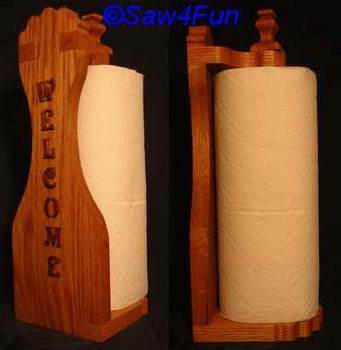 Use this simple step by step woodworking project to create a paper towel holder for your kitchen or shop. This plan takes the rod from an old paper towel holder then adds a decorative base and four wooden balls to stand on. 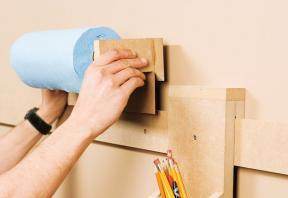 MDF blocks are used to build a strong and sturdy wall-mounted paper towel holder for the garage or workshop. 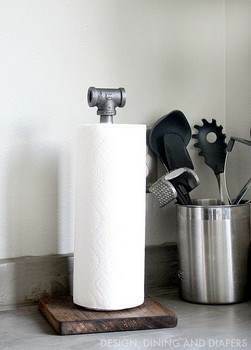 Build a unique and attractive paper towel holder that has a hidden storage area using this project. 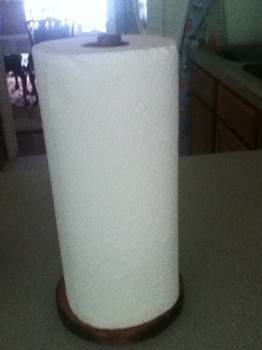 This paper towel holder has an upper shelf for salt and pepper shakers and other frequently used kitchen items. 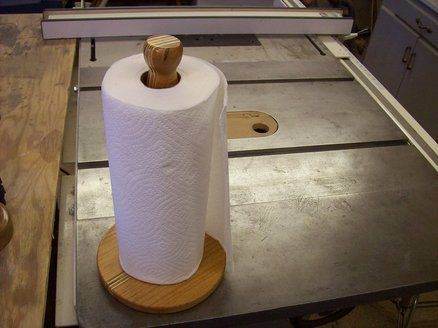 Here is a very simple to make paper towel holder that you can build in a short amount of time using wood scraps found in your shop. 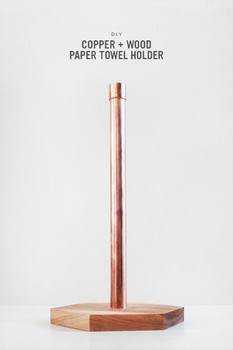 This is a plan for building a standing paper towel holder and a unique cheese cutting board.